"If you can suffer, you can gain. What is valuable cannot be obtained without effort." "Fearlessness may be a gift but perhaps more precious is the courage acquired through endeavour, courage that comes from cultivating the habit of refusing to let fear dictate one's actions, courage that could be described as 'grace under pressure' - grace which is renewed repeatedly in the face of harsh, unremitting pressure." (Aung San Suu Kyi, 1991, Nobel Peace Prize Laureate). 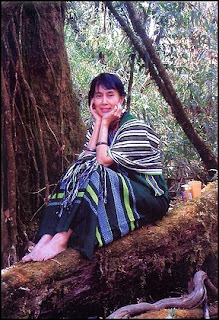 In my 2006 poetry journal, I have a picture of Daw Aung San, sitting outside in her small garden, reading. Her back is erect, softened only by the flowers tucked prettily into the nape of her neck. I refer to this picture in my mind many times, when I feel the weight of my own various exiles begin to push down on me. Grace under pressure, grace even as I suffer, these are the bells that sound Aung, Aung, Aung.... and I remember to breathe, straighten my shoulders and smile. Chiming for us all. You, and Ms. Suu Kyi. What lovely thoughts! And Aung, finally free! Free? From her house incarceration, maybe, but not from her captors. Democracy has yet a long road to go in Bhurma. Many thanks for your birthday wishes. This is certainly a beautiful post - being able to smile under pressure is indeed a mark of courage and will bring many graces.